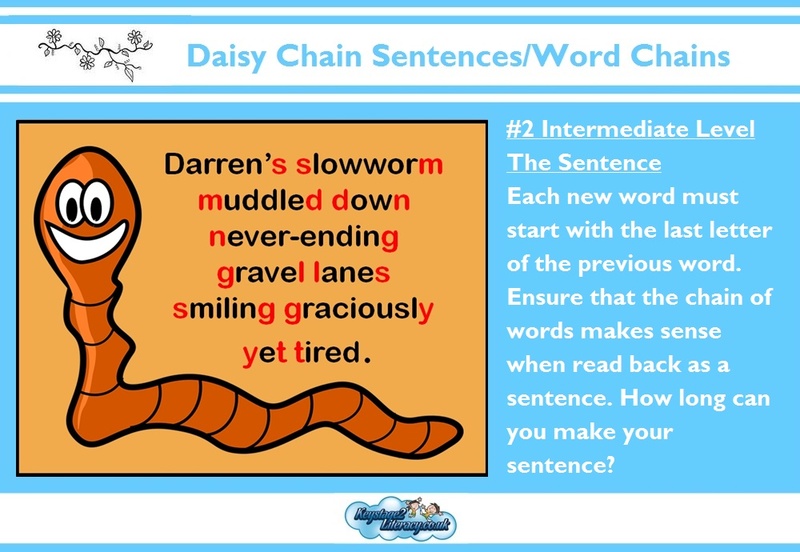 Daisy Chain Sentences are very simple and can be a fun way of getting children to consider the wide range of vocabulary they have control over as well as the broad range of adjectives, verbs and adverbs they know. 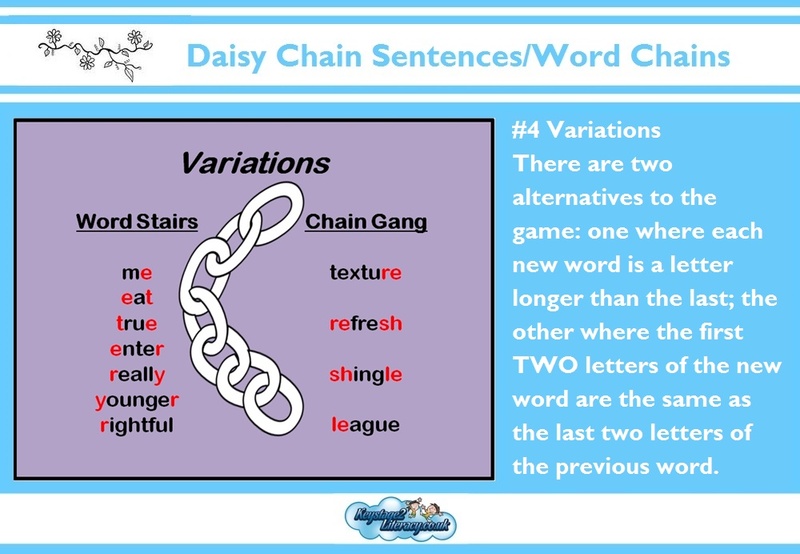 The idea behind Daisy Chain Sentences is that the next word in the sentence must begin with the last letter of the previous word. The real challenge is making sure that the sentence still makes sense. It will probably sound very silly but structurally, it should still make sense. The example below is eleven words long... how will your pupils get on? Another level of challenge is to get your last word to end on the same letter that you started with. 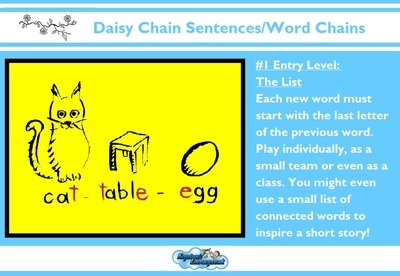 SIMPLIFY THE ACTIVITY: Instead of worrying about the connected words making a sentence (as this can get difficult), just play a round robin whereby the children need to simply come up with a word that is connected the last. If you play this as a whole class activity or game, you might add another level of difficult such as pausing or 'erm-ing' means you are eliminated. 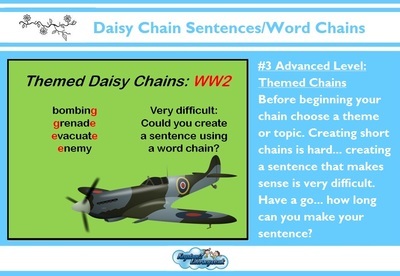 You continue until you have a Daisy Chain King or Queen! 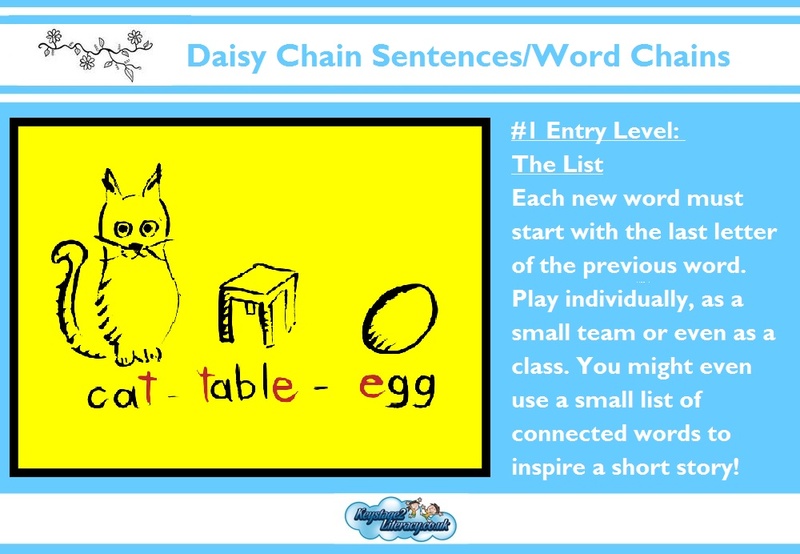 ADVANCE THE ACTIVITY: Either use the daisy chain sentence as a source for writing, or a list of words from the game. 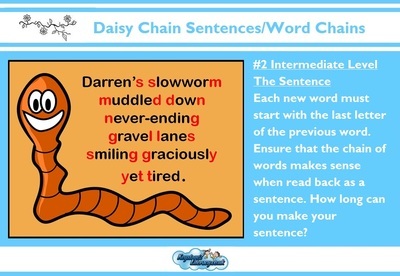 For example, in the daisy chain list: 'Darren- nuts- snake- elephant' could the children write a short story or improvise on the spot what could happen in a story that had these buzz words. Perhaps even write each word on a coloured piece of card and the children have to include them as they tell their story. 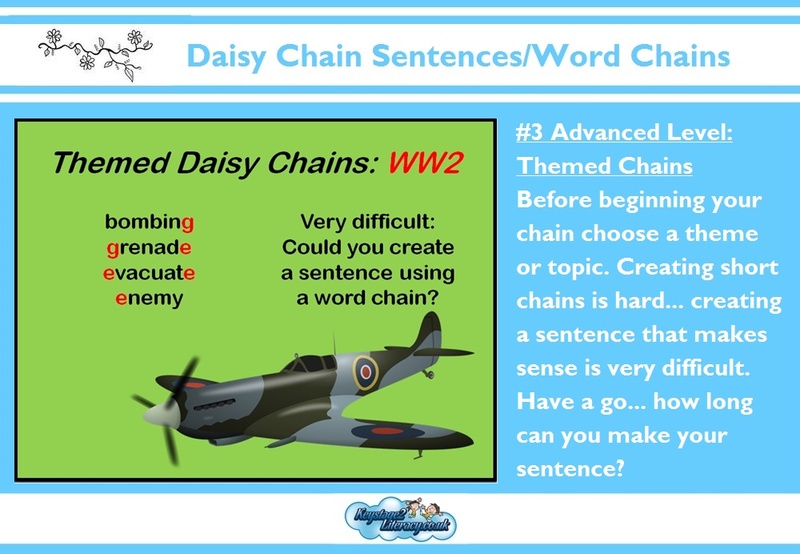 ADVANCE THE ADVANCED ACTIVITY: Before you begin your word chain activity, you could explain that you would like words that link to a particular topic so that when you come to tell or write a story about it later, they are relevant. For example, if you are studying World War II, the game might go a little like this: 'bombing, grenade, evacuate, enemy' and so on. Now you have the basis of a short piece of writing where the aim will be to use all of the words from the game. Darren’s slowworm muddled down never-ending gravel lanes smiling graciously yet tired. 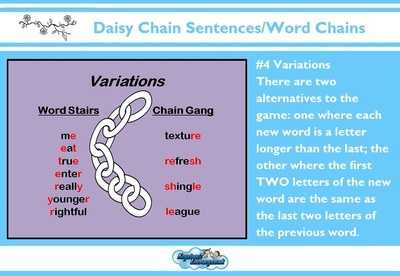 Shiritori is where Word Chain or Daisy Chain Sentences originate. 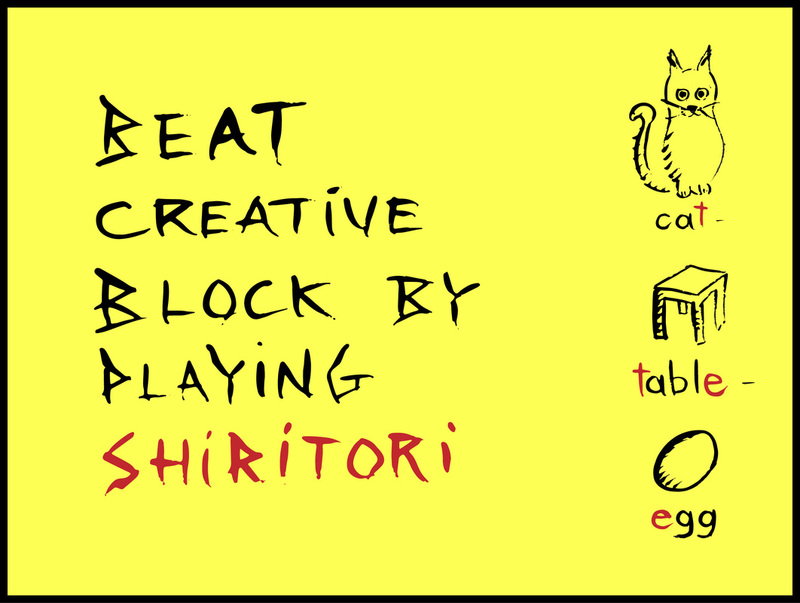 Shiritori is Japanese and means 'Taking the End.' 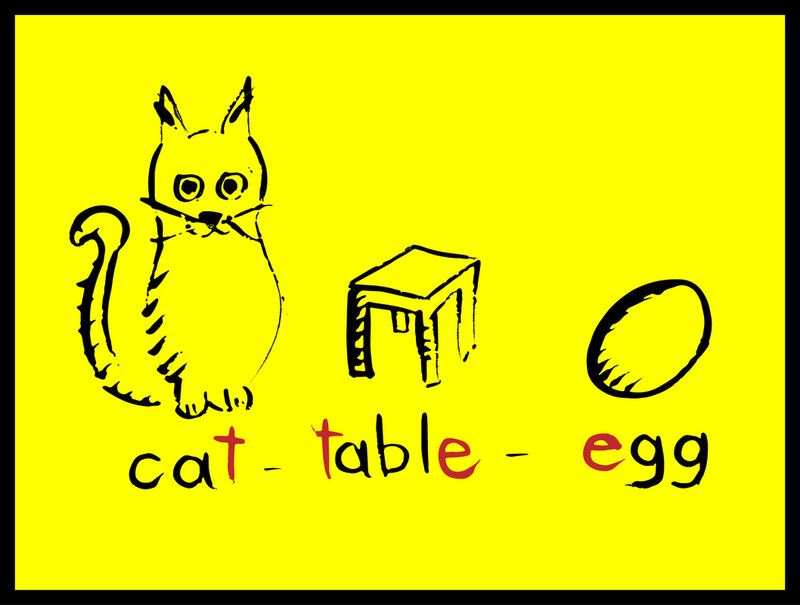 With the original game, the words have to be nouns. The game can be played individually or with a friend or group of friends. The person who is last to think of a word is declared the winner. Words may not be repeated. In these games, the words would often be limited to a given genre announced at the beginning. The length of the word must also be at least three syllables. The English version is slightly easier in that the items in the list can be nouns, verbs or adjectives and can be of any length. This version requires players to keep to the same rules as above but each word should contain one more letter than the previous. This version requires players to use the final two letters of one word as the first two letters at the beginning of the next word.